If you’ve never been to Calgary, you’re in for a real treat. Whether it’s making sure to drink a double double, wearing shorts if the weather hits a tropical ten degrees celsius, or interpreting a thousand different meanings of the word ‘eh’, you should really enjoy your time in this Canadian city. Eh? Of course, most of your experiences in this largest city of Alberta province will take money, so it’s important to know where to change your cash. Read this guide to avoiding the rip-offs and finding the best places to exchange currency in Calgary. There are certain factors to keep in mind when converting the cash you’ll need for your trip - avoid hotels and airports, compare ATMs to exchange offices, and be aware of how much you’re truly being charged for your conversion. You're likely to get ripped off if you're somewhere with only one currency exchange service available - like an airport or hotel. 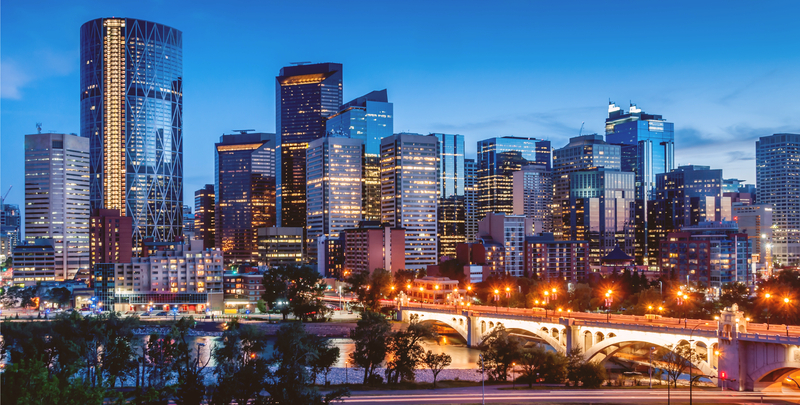 Travelex branches are available in Calgary airport, with an office at the arrivals hall. Check out the rates they have on offer, but be aware that fairer deals may be found in town. If an exchange booth advertises ‘No Commission’, it only means no fees are being disclosed upfront. Instead, these charges are absorbed into the exchange rate you're offered. The mid-market rate is the only real exchange rate - the one banks use to exchange large volumes of money between themselves. You will quickly notice that rates given to regular consumers tend to be less favourable due to bank markups and fees. An online currency converter can help you keep track of the true value of your money and spot the fairest deals. When you change cash, avoid changing too much. If you end up with money left over after your visit, you'll get hit twice for fees - once to exchange to CAD, and then again to change it back. Instead, calculate what you need for your trip and spend what you’ve converted. Withdrawing from an ATM is one of the most convenient and economical ways of exchanging cash whilst abroad. Not only do you have the convenience of using your card, but the rates are usually more favourable than a currency exchange office. Before you go, check with your local bank to see if they have an arrangement with any local banks in Canada. An arrangement like this may mean less fees when withdrawing cash from ATM owned by that local bank. Also, be sure to notify your home bank that you’ll be traveling in order to avoid your card being suspended due to suspicious activity. If the ATM asks if you want to be charged in the local currency or your home currency, always choose the local. That means during your stay in Calgary, choose to be charged in CAD. If you choose to be charged in your home currency, the ATM does the conversion for you and at a generally poorer rate. Choosing to be charged in the local currency means a fairer rate will be applied to your conversion. If ATMs aren't for you, then there’s always the option of changing your cash once you arrive in Calgary. These services will charge their own fees, often in a two-part bundle: declared upfront fees, and charges hidden in their offered exchange rate. Mon-Fri 9:00-17:00, Sat 10:00-16:00, closed Sundays. Call the branch for details. RBC Royal Bank has 50 locations scattered throughout Calgary. Use RBC Royal Bank’s branch locator to find the one nearest to you. Like regular banks, most branches are not open on the weekend. Check the specific branch location info online or call ahead before you visit. Alternatively - for an even better deal - use Transferwise. If you have a bank account in Canada, or know someone who does, you can transfer money between accounts using the real mid-market exchange rate. This gives you the CAD you need for your trip, for less.